The kids had great questions, and hopefully I and the other panelists gave them valuable insight into considering adoption—whether through a pregnancy they’re not prepared for or in the event they’re unable to have children biologically. Taking to Mary and what Sharon had been telling me, I learned some cool things she does with her students. I knew I wanted to talk to her on video to show off how some Shawnee young adults are learning valuable lessons beyond the classroom! Mary K (Lopez) Rolette and I went to school together here in Shawnee. We both have parents who were on the faculty of Oklahoma Baptist University, so there’s some bison blood running through our veins! 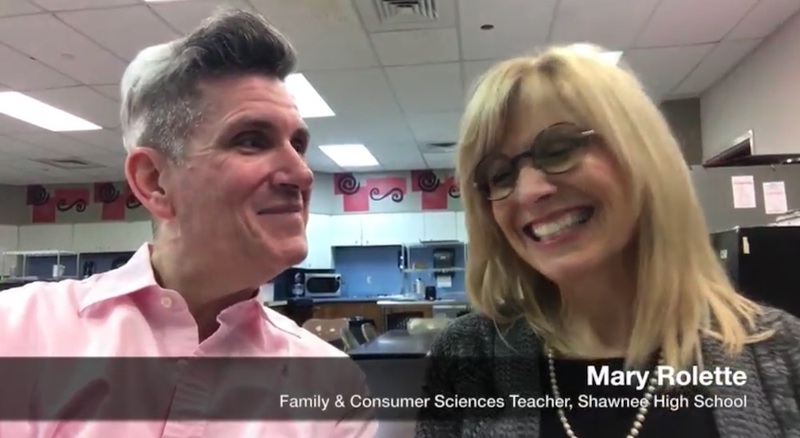 Mary teaches Family and Consumer Science and is one of the sponsors of SHS’s Family, Career and Community Leaders of America (FCCLA) Club. These students participate in some important community service projects. I love seeing people learn at an early age the value of being productive citizens contributing to the quality of life in their community. I receive great joy celebrating the many businesses, organizations and people who are making a difference in Shawnee.